Starbrite Farm has a relationship with an organic farmer that grows Hardy Kiwi (actinidia arguta). 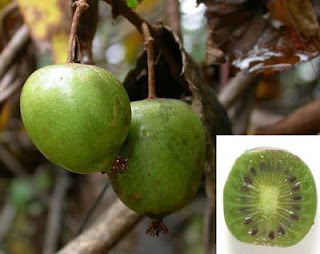 Hardy Kiwi (actinidia arguta) also known as Siberian Kiwi is a native of Northern China, Korea and Russian Siberia. It is similar inside to the fuzzy tropical kiwi, but has smaller seeds and a smooth green skin with only a bit of vestigial fuzz on the blossom end. It is super nutritious being 5 times higher in vitamin C than oranges and with twice the vitamin E of avocados. It is also rich in potassium, B-6 and B-2. The fruit we have comes from Dave Jackson of Kiwi Korners, Aka, Kiwi Organics in North central PA. A retired Rock drummer, Dave has been working with Kiwi for nearly 20 years and developing his own varieties. The fruit is eaten like a grape with the skin. You may pull out the previously noted bit of fuzz before popping them into your mouth. You will receive them in a fairly hard unripe state and will need to keep them out on the counter to ripen for a day or two. They are best and sweetest when they are very soft and the skin begins to darken and get a little wrinkly. In the refrigerator they will continue to ripen but very slowly. You may want to leave some out and keep some in the fridge, and you should return ripe ones to cooler if you are not ready to eat them right away. They are quite delicious but avoid the temptation to eat too many at once as they are also quite acidic. The crop was very short this season, so we are lucky to have them. Starbrite Farm will be selling Hardy Kiwis for the next 3-4 weeks. Passion poppers for this week which are smaller but also sweeter than the Annas, which they will distribute next week. The cost is be $4 per pint by preorder. (I expect Whole foods is charging at least that much for ½ pints) You can pay Dave at pick up. Farmer John needs to know by late today or tomorrow if you are interested. Please email me at millburnshorthillscsa at gmail dot com ASAP. PS This is available to all CSA members.